You learn a few things during 150 years in business. Today, we apply that expertise to serve customers and communities in 70 countries/regions. 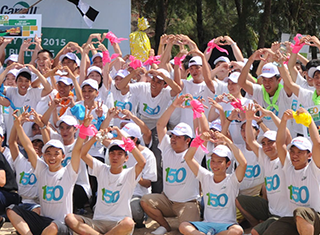 We have 155,000 employees working every day to nourish the world in a safe, responsible, sustainable way. Find out more about our global operations. We have around 24,000 employees across the world serving food and beverage manufacturers, foodservice companies and retailers with food ingredients as well as food and non-food applications. Cargill provides food, agriculture, financial and industrial products and services to the world. Together with farmers, customers, governments and communities, we help people thrive by applying our insights and over 150 years of experience. We have 155,000 employees in 70 countries/regions who are committed to feeding the world in a responsible way, reducing environmental impact and improving the communities where we live and work.